Running low: US President George W. Bush. A majority of Americans say they haven’t benefited from the tax cuts that Bush pushed through Congress during his first term. Washington, DC: Almost two-thirds of Americans say a recession is likely in the next year and a majority believes the economy is already faltering, according to a Bloomberg/Los Angeles Times survey. Americans say they expect a recession and the chances of that economic slowdown is between 65% and 29%, the poll found. Nearly 51% say the economy is doing poorly, compared with 46% who say it is doing well—the gloomiest view since February 2003. The negative sentiment on the economy contrasts with a June poll in which 57% of respondents said it was doing well. The pessimistic turn comes just before the Federal Reserve meets next week to decide whether to further reduce interest rates to try to head off a possible recession. The poll results square with the Reuters/University of Michigan consumer index, which showed confidence in October at its lowest ebb since August 2006. “I’m starting to think there’s a good possibility of recession," said poll respondent Roger Sharp, a retired procurement analyst in Milwaukie, Oregon. “The housing industry is driving the economy down and people are starting to get laid off from jobs that have been around for a long time," said Sharp, 63, a registered Republican. The poll brought bad news for his party: By 44% to 33%, Americans say Democrats would be better than Republicans at restarting growth should a recession occur. Moreover, Republicans seem to be losing the anti-tax card that has helped them win elections over more than a quarter century. A majority of poll respondents oppose leading Republican presidential candidates’ plans to cut taxes on corporate profits and maintain lower rates on investment income, such as capital gains and dividends. A majority of Americans also say they would tolerate higher taxes to help pay for universal health care, an idea that all the leading Democratic hopefuls have championed. And about two in three say they haven’t benefited from the tax cuts President George W. Bush pushed through Congress during his first term. “A lot of the air has gone out of the tax-cut movement balloon," said Stuart Rothenberg, publisher of the non-partisan Rothenberg Political Report in Washington, DC. “Republican candidates who think that tax cuts are the way to swing this election may be engaging in some wishful thinking." The 19-22 October poll of 1,209 adults had an error margin of plus or minus 3 percentage points. The mood among voters is sour. According to the Bloomberg/Los Angeles Times survey, 68% of the public says the country is “seriously off on the wrong track." 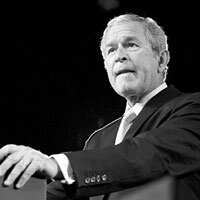 Bush’s job performance is viewed negatively by 60% of voters. The Democrat-controlled Congress gets even worse ratings, with almost seven in 10 voters saying they disapprove. Voters are closely divided over whether lawmakers support Bush too much or too little. The number of all Americans who expect a recession has risen five percentage points since April, when 60% of those polled said it is likely within a year. More than one in five respondents to the latest poll call a recession very likely, while more than two in five say somewhat likely. Only 9% say a recession within a year isn’t at all likely. Even a majority of Republicans, who were much more sanguine about the economy than Democrats, say a recession is likely. Women are more bearish than men, with 73% saying they expect a recession versus 56% of men. Six in 10 people surveyed say they would be willing to repeal tax cuts to help pay for a health care programme, which insures all Americans. Democratic presidential candidates Hillary Clinton, the campaign front-runner and a New York senator, Illinois senator Barack Obama and former North Carolina senator John Edwards have embraced the idea. Most of the highest income group polled, those in households earning more than $100,000 (Rs39.6 lakh) annually, support it. While more than eight in 10 Democrats say they like the plan, most Republicans oppose it. Independent voters, such as Michelle Scranton, side with Democrats. “I work in health care and I see a lot of uninsured people come through and they don’t seem to get the care they need," said the 29-year-old dietician from Carroll, Iowa. An agenda focused on health care and education spending would be better for the economy than returning money to taxpayers through tax cuts, she said. “In the end it would cut costs," Scranton added. By 52% to 36%, Americans favoured health and education spending as a better economic stimulus than tax cuts. Fewer than half of the survey respondents say investment income should be taxed at the same rate as wages. Currently, the rate on capital gains and dividends is 15%—less than half the 37.9% top rate on wages and salaries. About 16% of those polled say investment income tax rates should be raised, while slightly more favour keeping rates on such income lower than earned income. All of the major Republican presidential hopefuls have committed to maintaining the lower rate on investment income, and former Massachusetts governor Mitt Romney has proposed eliminating the tax for middle-class Americans. Americans have also lost some faith in Federal Reserve Chairman Ben Bernanke, with only 38% saying they approve of how he’s handling his job—down from 50% in March.